I loved the whiteness and geometry of this scene, but I knew I wanted a little something extra. 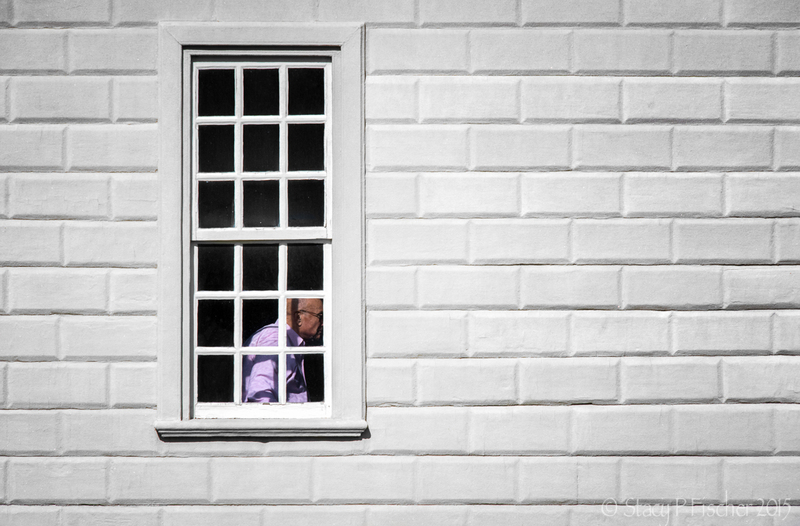 So, with viewfinder to eye, I waited patiently for someone to pass behind the windowpanes. I was rewarded by this gentleman wearing a vibrant purple shirt. Along with the white of the wall, the scene screamed “fresh” to me – fresh, bright colors of the coming spring. This entry was posted in Photo Challenges and tagged brick walls, miksang, photography, postaday, purple, weekly photo challenge, windows. Bookmark the permalink. Thanks for the reblog, Douglas! You’re always so very kind to me. I like it. If the man wasn’t in the window, the picture would be too ordinary, ie anyone could have taken it. It’s certainly a very happy photo, Stacy, and the brightness of the colours and the sunshine on the wall do make it look very refreshing. Great shot and timing ! I like doing the unexpected, Nelson 😉 Thanks! the contrast of the monochrome nature of the picture and the colour of the man does jump out at you. The colour does also add a freshness that would otherwise be quite a stark picture. Really nice. Your efforts have been paid. This gentleman made your picture alive. Awesome! So you were hanging out at this person’s window all day waiting for a glimpse, a glance of someone? Something? I was arrested for doing the exact same thing. Except I had binoculars instead of a camera. And it was the middle of the night.And she just happened to be getting ready for bed…. Well, it was actually my wife I was spying on. She’s a bit shy. When I explained to the arresting officer, we had a good laugh! Great timing, a well composed photo, the person walking past add a nice element to this. Nice. I do that sometimes. Glad to hear I’m not the only one, Luis 😉 Thanks!